What do you look for in a hotel? Price? Comfort? Location? Great works of art? Speaking of art, hotel art is usually bland, nondescript prints or cheap reproductions bolted to guest room walls. Not anymore. More and more hotels are evolving into showplaces for showpieces, and turning into mini-art galleries. Many display works of well-known international artists, while others showcase emerging local artists. And in many cases, the exhibits not only rotate, but everything is for sale. Some hotels even have their own curators, and others turn each room into a piece of living art. Here are seven of the best art hotels in America, from coast to coast. Let’s start with a hotel that actually doubles as a museum. 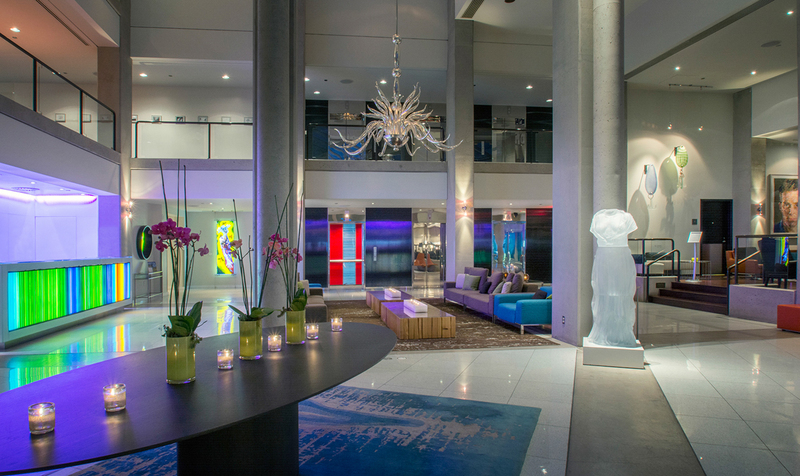 The hotel 21c, located in Louisville, Kentucky, has such a vast collection of art that it even has a curator on staff. Opened in 2006 by husband-and-wife art collectors Steve Wilson and Laura Lee Brown, the property features a 9,000 square-foot-museum along with an international collection of contemporary works in its public and private spaces. What sets this hotel apart is that it was originally designed as a museum; the hotel came second as a way to fund the museum’s operations. And while you may not think of Louisville as an artsy destination, Wilson and Brown’s goal was to remind people that you don’t have to travel to major metropolitan areas to see great art. At 21c, you’ll find original prints in each guestroom, as well as the elevators, lobby, bathrooms, hallways, and the restaurant. Some of the larger permanent pieces scattered around the lobby, garden and entryway are one-of-a-kind works worth millions. Highlights include the hotel’s signature red penguin sculptures, a Baroque chandelier hanging from a gallows pole outside the building that actually makes “breathing noises, and an interactive “text rain” projector in the elevator lobby that “rains” words onto guests. The hotel also features artist lectures, a monthly film series, and a cable channel in each guest room that showcases nothing but video art. The gallery also offers rotating solo and group exhibits featuring regional, local, and international artists. Though none of the artwork is for sale, Wilson and Brown can put interested collectors directly in touch with the artists. 21c also operates museum hotels in Cincinnati, Bentonville, Durham, Lexington, and Oklahoma City. Just steps from the gates of Chinatown, the Hotel des Arts in San Francisco lives in a turn-of-the century building that has been everything from a boarding house to a bakery. These days, it’s a hotel in which each room is an individual gallery, and guests can buy works made by an impressive array of national and international artists. The brainchild of art lover and businessman Richard Singer, the Hotel des Arts has 52 rooms, each of which is designed floor-to-ceiling by a different artist. Far from being “themed” rooms, each space is designed with unique styles ranging from edgy graffiti to organic painted designs. For example, one room decorated with militant propaganda art might give off a slightly disturbing Big Brother vibe, while artist Chandra Michaels’ “Sugarluxe” room dazzles with quirky and colorful sweetness. 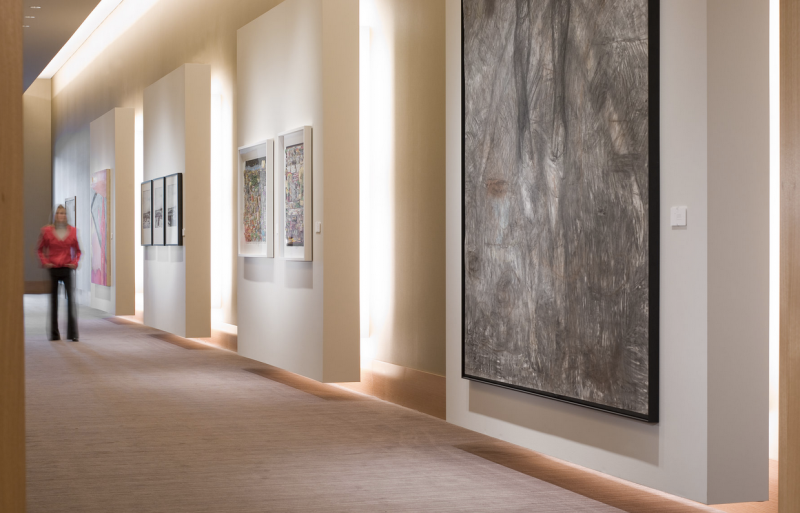 In addition to in-your-face artwork in the rooms, the hotel’s hallways, corridors and lobby also comprise a living gallery with 150 rotating pieces—each of which is available for purchase. The gallery highlights a diverse selection of artists with a heavy emphasis on local Bay Area residents who create everything from digital art to painted wood installations. Prices range from $150 to $6,000, with all the money going straight to the artists. This hotel (formerly the InterContinental) may technically be attached to O’Hare, but unlike most airport hotels, this one will surprise you—and even indulge your inner art-lover. Purpose-built to design and display art, this brand-new 550-room gallery/museum/hotel has 1,500 pieces in the guest rooms alone, plus another 65 pieces throughout the public areas and gallery space. And though the hotel does have a concierge, it also has two full-time art curators who offer champagne art tours every afternoon. The permanent collection consists of three distinct pieces in each guest room and the lobby, while the corridors, lobby and other public spaces offer a stunning selection of sculpture, 3D installations, and paintings, most of which are available for purchase. Some of the more notable pieces include three Rauschenbergs, two Dalis, and the $55,000 “Alphabet” set by Tony Fitzpatrick, the only complete 26-piece set in the world. The hotel’s Art/Museo Collection also features the works of Jay Ryan, who has been making screen-printed concert posters in Chicago since 1995. Though the InterContinental O’Hare has only been open a few months, they have already sold several pieces and plan to rotate the collection every six months or so. It may be cold in the Midwest, but the art is hot. 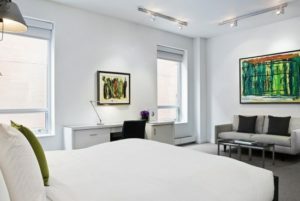 And you’ll find a lot of it at the Chambers Hotel in Minneapolis, which boasts a collection of abstract, provocative contemporary art created primarily by American and British artists. The 200-plus pieces in the Chambers were all hand-picked by owners Ralph and Peggy Burnet, who are considered to be among the top 200 art collectors in the world. The artists range from art students to internationally known names like Damien Hirst. Though the pieces on permanent display in the public areas and the guests rooms aren’t for sale, if you’re so inclined you can buy a piece or two from the commercial gallery, which has exhibits that change four to six times a year. And in one area, the Chambers really steps “out of the box” by keeping it in the box … the television box, that is. The hotel features an enormous amount of video art, including an outdoor projection screen and 44 monitors in the hallways playing videos created by more than 60 artists such as William Wegman. And how’s this for cool? The hotel houses something called the Art-o-Mat machine which is both an art-dispensing device and a piece of art itself. 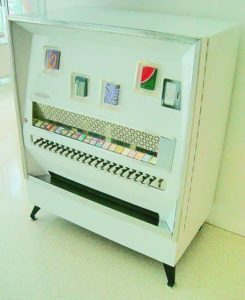 Basically a revamped cigarette machine, the Art-o-mat takes $5 tokens and in return dispenses cigarette-pack sized pieces of art made by dozens of local artists. You never know what you’re going to get, but that’s part of the fun! With so much going on art-wise at the Chambers, you may almost feel overwhelmed. If so, you may want to consider taking a tour, which can be done privately or in a group. The art director will give you a mini crash-course to help you appreciate the hotel’s world-class collection. Want to experience New York’s Central Park through art? Then head to JW Marriott Essex House on Manhattan’s Central Park South. In 2007 Essex House launched an art program designed to explore the past and present of the park. The program includes a curator, an artist-in-residence program, and a partnership with the Museum of the City of New York. The artist-in-residence program allows artists to live on the doorstep of their muse, and thereby provides inspiration to create art that interprets and celebrates the park. So far two artists, Atta Kim and Mark Inerst, have created paintings and photographs which are on display in the lobby. The “Heart of Central Park” exhibit in the hotel’s dedicated gallery space tells the history of the park through photographs and watercolors that were hand-picked from the archives of the Museum of the City of New York and the Magnum photo agency. Photographs are also displayed throughout the corridors of the hotel. The photographs themselves are not for sale, but reprints are available for purchase and the hotel can put you in contact with other galleries or directly with the artists. Curator Katie Gass, who is currently the only hotel curator in New York, gives art tours of the hotel and of the city by appointment. Guests can also take self-guided MP3 walking tours of Central Park to learn more about the local art and architecture. In the Pacific Northwest, you’ll find a different kind of art at the Hotel Murano in Tacoma, WA. The entire hotel is devoted to glass, displaying works from more than 45 glass artists from around the world. Hotel Murano is a converted Sheraton that opened in March 2008 in the heart of downtown Tacoma, which has a long association with the glass-making industry. In fact, the hotel is only steps away from the Museum of Glass. Formerly a bleak industrial wasteland, downtown Tacoma has been undergoing a revival for several years (of which Hotel Murano is part) and is now abuzz with hip galleries, music joints and restaurants. Each floor of the Murano is devoted to a different artist. The rooms contain one-of-a-kind hand-blown pieces such as lamps and vases, as well as sketches that showcase the artist’s inspiration. Educational displays in the halls and lobby offer biographies on the artists and background and insight into the glassblowing process. The hotel’s common areas are filled with striking pieces by international artists such as Costas Varotsos, who created the massive 100-foot-high steel and glass creation in front of the hotel, Massimo Micheluzzi, who created the stunning chandeliers, and Vivek Skov, who designed the three multi-colored glass Viking ships in the lobby. Though you can’t buy the art off the walls or from the lobby installations, three display cases on third floor contain a rotating variety of pieces for sale from local glass art galleries. There are also smaller pieces for sale in the museum shop. Tours are offered to the public every third Tuesday of the month, but make sure to reserve in advance. If you want to hobnob with Andy Warhol in the lobby or Keith Haring at the bar, then hop on over to New York’s Gramercy Park Hotel. You won’t literally find those artists there, but you’ll certainly find their legacies. Designed by artist Julian Schnabel and owned by former Studio 54 proprietor Ian Schrager, the Gramercy Park Hotel contains a dazzling collection of all-star New York art throughout the guest rooms and public spaces. In the lobby you’ll find pieces by Andy Warhol, Jean-Michel Basquiat, Damien Hirst, Richard Prince, Keith Haring, and Julian Schnabel himself, just to name a few. Aside from the art lining the walls and in the halls, the hotel itself is a work of art. Its décor exudes Schnabel’s signature romanticist vibe from every corner, and includes a collection of hand-made, eclectic furniture such as medieval-style armchairs and gold-fringed red velvet sofas. Schrager was seeking to deviate from the usual cool-minimalist design ethic of his other hotels, and he really outdid himself here. From the decadent deep-burgundy color palette to the sumptuous materials such as marble and mahogany, it’s hard to tell where the hotel ends and the museum begins. Though you can’t buy the priceless artworks here, most of which are on loan from famous collectors, you can certainly admire it while having a drink in the bar or lounging before the lobby fireplace—a true artistic experience without ever having to step outside the hotel.